Winward Islands Yacht Charters – At the southern end of the Caribbean chain, the Windward Islands are the best-kept secret in the Caribbean tourism lore. Situated as the last links before Trinidad and South America, the Windwards are lush and richly tropical volcanic islands green with palm lined sandy beaches. Unlike the dry, scrubby Leewards, the Windwards are off the beaten path and in that lie their splendor. Following is a typical itinerary for a charter yacht trip of a lifetime. Arrive at St Lucia airport (served by American Airlines) to be greeted and transported to Rodney Ray Marina by the crew. Relax, unwind and unpack to settle in aboard your new home for the next week. Rent a 4-wheel drive vehicle for some exploring or hiking, stroll the shops or take an afternoon swim. Tomorrow is a big day. Awake and well fed, leave just after breakfast for a short cruise to Soufriere, St. Lucia and the famous Pitons. For sheer physical beauty, the area around here is outstanding. Soufriere is a small picturesque town of French Creole ancestry. This is a huge day for photographers. The Pitons are sheer mountains that start at the sea and tower 2600 feet almost straight up. Today we leave St. Lucia behind and travel at high speed for St.Vincent and the Grenadines. Home of the 3000′ active Soufriere Volcano (not to be confused with the town we just left). The daring in your group will hike the well-marked path to the cone for lunch and enjoy breathtaking views. Others will enjoy a small boat trip to the Falls of Baleine. We’ll spend the night anchored in Chateaubelair, the most scenic anchorage in St. Vincent or Cane Garden near Kingstown ( and shopping) the capital. Leaving after breakfast we arrive at the island of Bequia. 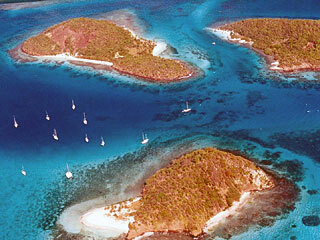 An old whaling island Bequia, is a favorite among yachtsmen. Boats are still built by hand on the beaches there. Descending from Scots and French, the inhabitants of Admiralty Harbor are proud people. Diving is exceptional and can be arranged for you by the crew. A land tour is recommended to appreciate this tropical Nantucket. We’ll spend the next two days in and around Mayreau in the heart of the Grenadine Islands. This small outpost of islets consists of powdery beaches and the bluest water you will ever see. Two days of watersports, beach parties, snorkeling, and exploring the wonders of this gem in the Caribbean. The calm Tobago anchorage sits behind a huge reef protecting it. The only thing between you and the coast of Africa is water. 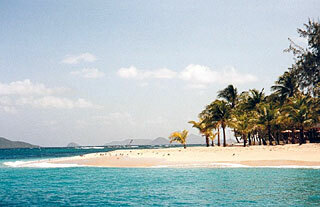 Leaving the splendor of the Grenadines will be tough on you, but the famous island of Grenada awaits us. Lush green mountains, waterfalls and golden beaches. 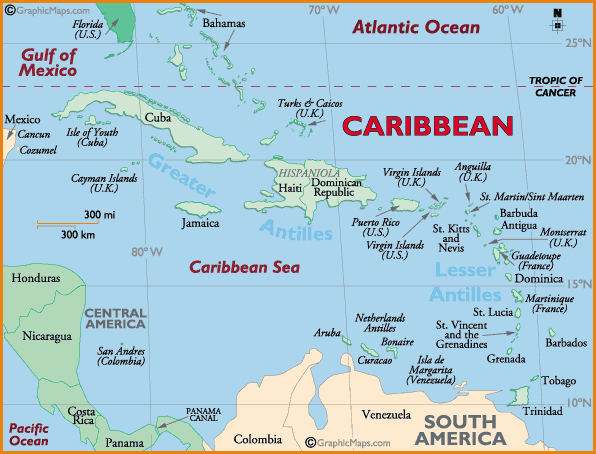 Grenada is the “Isle of Spice” due to the abundance of spice trees, not its lively history. Grenada is now a full democracy and has embraced tourism fully. Today and tomorrow will only give you a taste of this island’s treasures ensuring your return. A Crater Lake, waterfall after waterfall and the monkeys. Touring this island is a safari. Today is your day. Spend it anyway you like here in Grenada before you have to say goodbye and travel to the airport (American Airlines). Revisit, shop or swim and snorkel. Its up to you because by evening you’ll be back home relaxed and ready to attack the rat race again.